Red Auerbach's parents were Russian immigrants, and he had a hardscrabble beginning in Brooklyn, where he washed taxicabs and worked at his father's dry-cleaning shop. He played basketball at PS 122 in Brooklyn, lettered at Eastern District High School, and earned an athletic scholarship to George Washington University. He coached at St. Albans Prep and later Roosevelt High School in Washington DC, and earned extra income with part-time work as a referee. After a stint in the Navy, with only high school and military coaching on his résumé, he became a professional coach simply by walking into the offices of the Washington Capitols and telling them he was the best man for the job. Auerbach was quickly offered a job by the then-pathetic Boston Celtics, who had gone 22-46 and finished in last place the previous season. While discussing the job, he recommended that the team's owner should draft Chuck Cooper, a black college player. No blacks had ever been drafted in the NBA, but the Celtics picked Cooper, and hired Auerbach two days later. He remained in the team's employ for the rest of his life. Through most of his coaching tenure with the Celtics, Auerbach's teams played a high-pressure defense led by Bill Russell. They ran only seven basic plays on offense, but those plays led to nine championships. Auerbach's Celtics won an amazing eight consecutive NBA titles from 1959 to 1966. As a coach, he was credited with making bench players and role-players an integral part of the team. He often said it was more of an honor to make his "finishing five" -- one of the players in the last few minutes, when the game was on the line -- than his "starting five". He became known for smiling and lighting his cigar at courtside when he was certain his Boston Celtics would win the game. Still, his habit of lighting that cigar when he knew the Celtics would win was an annoyance to opposing players, and to several Celtics. Bob Cousy complained that the cigar was a "trigger point" -- it irritated the other team, angered fans on the road, and sometimes led to more aggressive and painful fouls in the game's closing minutes. But the fans loved it in Boston, where to this day some restaurants have posted "No smoking," and in smaller letters, "except Red Auerbach." He retired as coach in 1966 to concentrate on his duties as general manager of the team, and handed the coaching reigns to Russell, who became the league's first black coach. 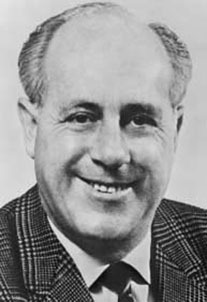 Auerbach, upstairs as GM and later as Vice Chairman of the Board, eventually brought the Celtics seven more championships. Auerbach's brother Zang, a political cartoonist for the now-defunct Washington Star, designed the Celtics' famous logo.